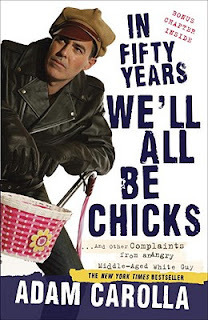 Book Passage contributing blogger Zack Ruskin interviewed Adam Carolla, author of In Fifty Years We’ll All be Chicks ($15.00). Carolla will be appearing at Book Passage in San Francisco on Saturday, June 4 at 3:00 pm. Zack Ruskin: Between taping your podcast, your live shows and the many guest appearances you make, you go through a lot of material. How did you decide what was going to be kept for your book, and as a result, do you make an effort not to talk about the topics in your book when you’re on the air etc.? Adam Carolla: I don’t really make a strong effort in any direction. I just sort of talk, and certain topics remind me of specific things. When you talk as much as I do, sometimes people tell me something I said in a Loveline five years ago and I say wow man, that’s great. If you bring up a topic, my brain works in a certain way, and I’ll be triggered. Sometimes I’m on stage talking, and I’m not sure if it was in the book. I wrote the book a year ago and I just can’t remember what I put in that thing. I’d have to re-read it. ZR: Did you find the writing process to be kind of like you were transcribing your tangents, or did you have to change things to make it work in a book format? AC: It pretty much felt like transcribing my tangents. You have to sort of clean it up a little bit, make it a little bit more cohesive. I don’t know if you need to do this, but your editor tells you to clean it up. I was like eh. I mean, what do you want? You want it to flow, you want it to move along nicely, but sometimes up in the book world, people are like, we need a title, and then they need a mission statement for the title. It’s a little cart before the horse. I understand their angle, but you get trapped behind the title, and I always tell people, look, it’s just a title I came up with. ZR: Are you planning on writing another book? AC: Yeah, I am writing another book, and the other book is going to be stories, true stories. My editor, and my audience, seems to enjoy the stories, and I’ve had a lot of stories occur in my life. I like telling stories; they’re easy. It feels a little like a cop-out, but Chelsea Handler writes stories, and that’s working pretty well for her. ZR: You, Sarah Silverman, Patton Oswalt, Michael Showalter, Gilbert Gottfried and Demetri Martin have all put out books recently. Do you have any theories about why so many comedians are writing books at the moment? AC: No, I don’t know if they always did, or I wasn’t attention. I never read anyone’s book. I lived in a world devoid of books, a world of Sportscenter and building cars. People would be like, you like George Carlin. I’d be like, oh, yeah. Well you should read his book. Oh. And then I’d go back to the garage. One reason I wrote a book is I’m going to be 47 in a few weeks. I never thought I’d have a book in me, but they come to you. They say, do you want to write a book? How much? $200,000. Ok. I didn’t decide anything. Same thing with Dancing with the Stars. It would be like your friend called and said, I got a free ticket to Maui, and when you get to Maui, everyone asked you why you went to Maui, and you said the phone rang. They offered me money. Now I’m glad that people like it, it’s kind of forever. It’s a least a compilation of your thoughts. ZR: Some people may not know you’re big on home repair and carpentry. You did the TLC show The Adam Carolla Project and you have the podcast Ace on the House. Have you ever thought of writing a home-improvement book too? AC: No, I don’t think that way. That’s my problem. I’m not going to leave my kids with a lot of money when I die. You see Bethany Frankel write her sixth book on happiness and then you watch her reality show and she’s a human faucet of tears, a pre-menopausal mess. I have low self-esteem, so that’s my excuse. Look, there’s 3 major cop-outs when it comes to famous people writing books. 1. I’m going to write a children’s book. It means you can’t write. 2. A “10 Days to Lose 10 Pounds And a Happier You”. 3. Books on being happy and together with the one you love. You’re actually the first person to ever mention a home repair book. It’s not a bad idea; I just don’t propose anything. You’d think my publisher would’ve called. ZR: Your parents get mentioned on your show a lot. If your dad wrote a book, what do you think the title would be? What about your mom? AC: You know, both of my parents are alive. The double-edged sword of them never caring is a windfall, because it allows me to talk about them with the knowledge they will never listen. If my dad wrote a book, it’d be called “Close The Door, I’m Playing the Trumpet”. My mom’s would be called “Not Today: A Lazy Parent’s Guide to Not Driving Your Kids Anywhere”.